Several days ago I received a physical letter in the mail from a (possibly) crazy person. Perhaps my recent blog about responding to Obama Derangement Syndrome may have struck a chord with somebody? 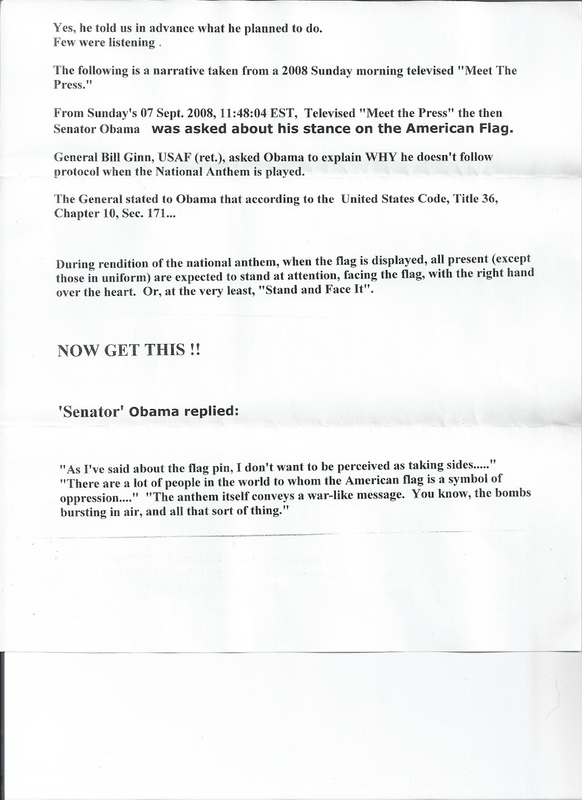 A person by the name of “Darnell Wooster” (whose apparent address is nearby, but I won’t reveal publicly) sent me an unsolicited letter that appeared to be a printed copy of a chain email containing purported evidence of (then) Senator Barack Obama’s hatred for the American flag and “The Star-Spangled Banner,” in the form of quotes from an alleged appearance on “Meet the Press” in 2008. Nothing was written by Mr. Wooster himself; rather, it was signed by someone named “Dale Lindsborg.” I have no idea who Darnell Wooster is, but a Google search for “Dale Lindsborg” quickly revealed an exact replica of the letter I’d just received. It was nice to have proof that this “transcript” of Obama’s remarks was indeed a hoax, but from the moment I opened the letter I could tell I was dealing with the work of a troll. You read that right: “Dale” timed Obama’s appearance on “Meet the Press” timed to the second. Which seems more likely --- a scenario in which the letter’s author performed the enormous amount of research to determine the exact second Obama was asked a question about the American flag in 2008? Or a scenario in which “Dale” simply made up that timestamp? Keep in mind, this author evidently enjoys alternating between normal text and giant, bold, improperly spaced letters for stylistic purposes. Obama’s love for 1970s Coke jingles was never revealed on “Meet the Press,” nor was it even made up by the author of this letter. In fact, it was blatantly stolen from a 2007 satirical column by conservative humorist John Semmens. Plagiarism awards you zero points, my friend. No, Dale, you’re not speechless. You took the time to put together this entire fake transcript, interjected your own commentary throughout, and signed it with intent to convince readers that you work for a major newspaper, which you obviously don’t (if you did, you would have known to italicize Washington Post, not underline it). That’s pretty much the opposite of being speechless. 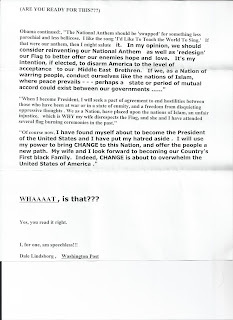 So, to recap: this letter is a definite hoax, and “Dale Lindsborg” appears to be nothing more than an Internet myth. But what about Darnell? Is he an imaginary person created by one of my friends or readers to play a trick on me? 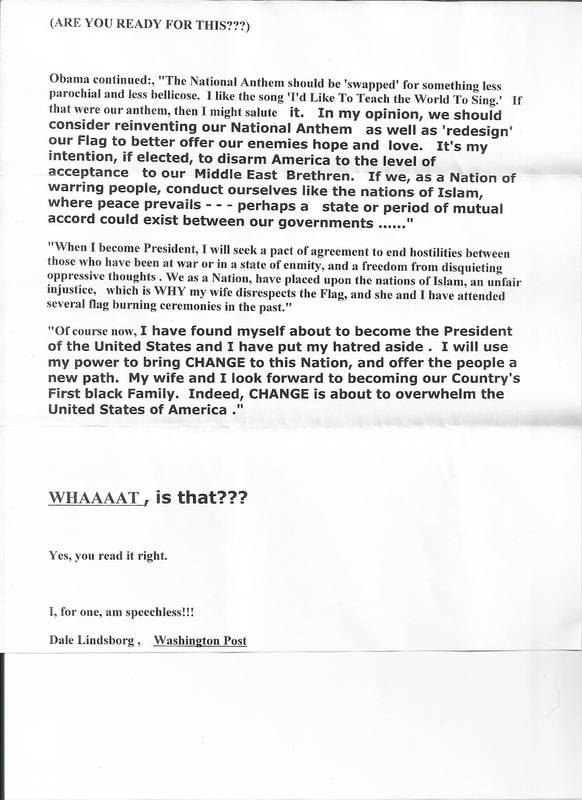 Or is he the more serious kind of troll – the kind so easily tricked by obvious chicanery that he spent his own money to print out copies of this letter and mail them to people? Nevertheless, President Obama is still crushing the polls as Election Day is just on the horizon. And as that just doesn’t sit well with those clueless, possibly-racist trolls who hate Obama the most, expect them to join Darnell Wooster in coming out from the woodwork in full force.